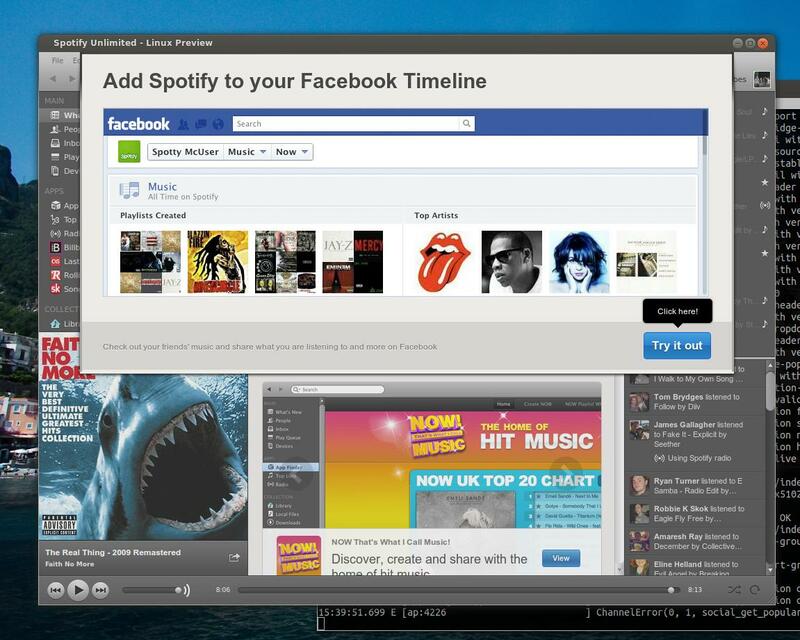 This “Add Spotify to your Facebook Timeline” popup appeared about 2 seconds after starting Spotify. It blocks the application, you can’t play music or even exit without killing it externally until you acknowledge it. The real problem though is that there’s no option to cancel, you have to “Try it out”. This button enables the “Show what I listen to on Facebook” option, which adds every track you play to your Facebook timeline (the option is in Edit > Preferences if you want to turn it off). It’s not hard to see why it’s in Spotify’s interest for you to do this – it’s advertising for them, and Facebook also benefits from knowing your music taste by being able to tailor advertisements for gigs. Sure, it’s not hard to turn it off if you know where to look but this feature should really be opt-in, and Spotify are effectively making it an opt-out by designing their application in a user-hostile way. And that irks me.